The VC, Prof. Olusola Oyewole (Left) welcoming the Legislator, representing Abeokuta South Federal Constituency, Federal House of Representatives, Hon. Segun Williams when the latter paid him a Courtesy Visit. The Vice-Chancellor, Federal University of Agriculture, Abeokuta (FUNAAB), Professor Olusola Bandele Oyewole, has stated that graduates of agricultural courses should be job-creators rather than job-seekers. Professor Oyewole disclosed this last week, when the legislator, representing the Abeokuta South Federal Constituency at the Federal House of Representatives, Honourable Olusegun Samuel Williams paid him a Courtesy Call in the University. The Vice-Chancellor charged the Rep to assisting in promoting the development of the agricultural sector, taking into cognisance, the fact that dearth of funds posed a big challenge to the sector. Seizing the opportunity to call on the people to see agriculture as a business venture, Professor Oyewole stated that agricultural graduates of the University, were encouraged to be self-reliant, through the Graduate Farming Employment Scheme (GRADFES), in which a loan of N200,000 is made available for them to practice, while their certificates are taken as collateral. The Vice-Chancellor added that another scheme of the institution, the Community-Based Farming Scheme (COBFAS), was also designed to expose agricultural students to the practical aspects in the various communities of Ogun State. According to him, the COBFAS Scheme had improved the socio-economic lifestyle of the communities, while youths in the communities are being influenced to pursue university education. 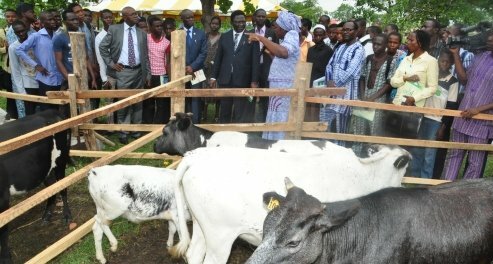 The Vice-Chancellor further revealed that the activities of the University had gone beyond Nigeria with the introduction of the FUNAAB Foreign African Scholarship Scheme (FUFASS), a scheme through which students from Sierra-Leone, The Gambia and Liberia are trained for between three to six months on scholarships in skills acquisition and agricultural enterprises. Professor Oyewole added that the Scheme could be replicated for artisans in the Abeokuta South Constituency to empower them with necessary knowledge and skills. He, however, informed his guest that the University would clock 25 years in 2013, following its establishment in 1988 as one of the three Universities of Agriculture in the country. In his response, Hon. Williams expressed the willingness to partner with the University towards its development, which he noted will have direct impact on his constituency. He said: “let us know the areas you can intervene and we tell you areas we need intervention, so we can enjoy the dividends of democracy”. In his response, the Vice-Chancellor reminisced on his early teaching days, which began in 1985, during which the current Deputy Speaker of the Federal House of Representatives, Honourable Emeka Ihedioha, was one of the eight students that graduated in the year. Professor Oyewole said the Deputy Speaker is more of a FUNAABITE than being an alumnus of the University of Lagos (UNILAG). He commended the former Speaker of the House of Representatives, Honourable Dimeji Bankole and Senator Iyabo Obasanjo-Bello, who had at one time or the other contributed to the development of the University. According to him, people who represent us in Abeokuta are people who know their onions well. «VC Tours First Bite Foods Ltd.